My two recent MaxForLive audio devices have both been based around having 6 processing sections - hence the 'hex' in their names. But I realised that there was a much simpler device that uses the hex pan section, which could be used in many ways, and this blog post is devoted to it: a hex spatializer! 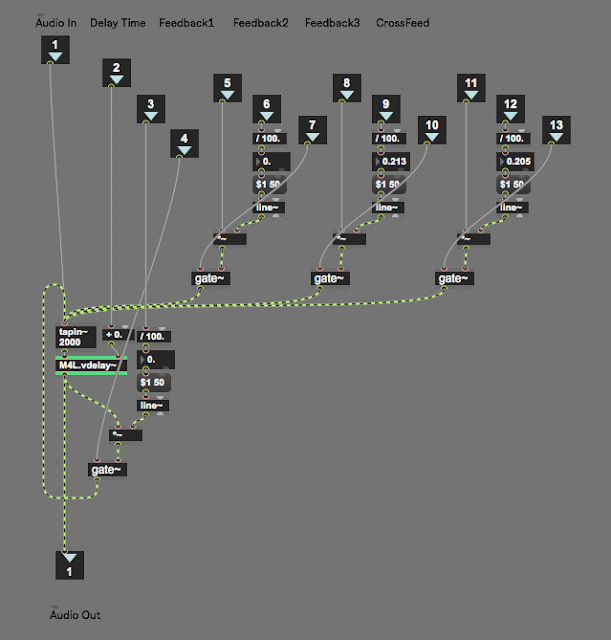 AUDhexSPATIAL moves parts of sounds around in the stereo field. That's all. It is quite straightforward, but don't let that fool you into thinking that you can't do much with it. 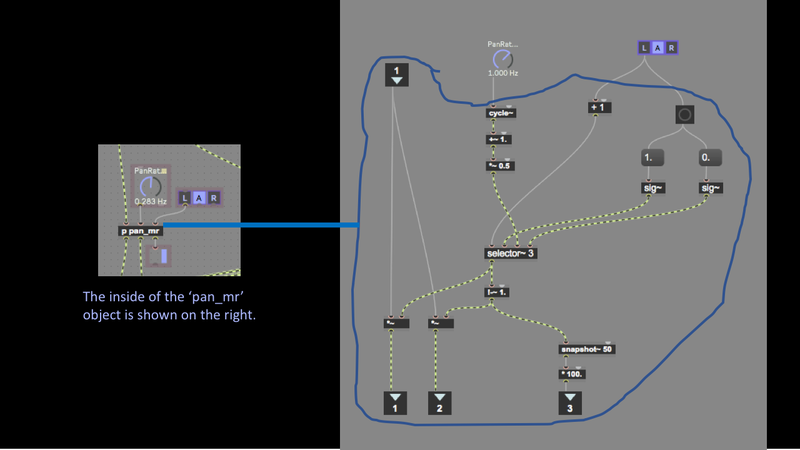 The input audio is passed through three parallel filters, and then the outputs are auto-panned across the stereo image. 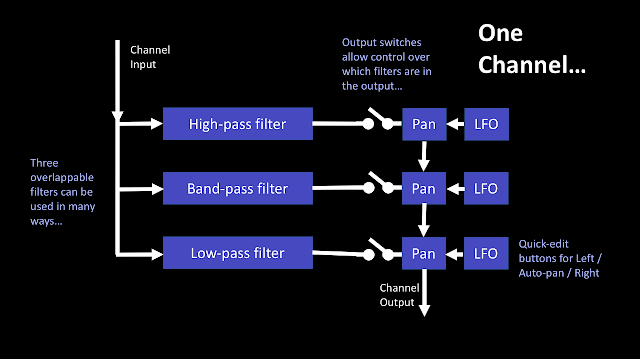 The three filters can be used in several ways, but the most obvious way is to use them to split the audio into three separate bands: The high-pass filter outputs the high frequencies, the low-pass filter outputs the low frequencies, and the band-pass filter outputs the middle frequencies. Each filter output can be panned to hard left or hard right, or can be Auto-panned - controlled by a three position switch: L/Auto/R. But the frequencies of each filter are independent, so there's nothing to stop you putting the high-pass filter below the low-pass, or the band-pass anywhere from low to high. 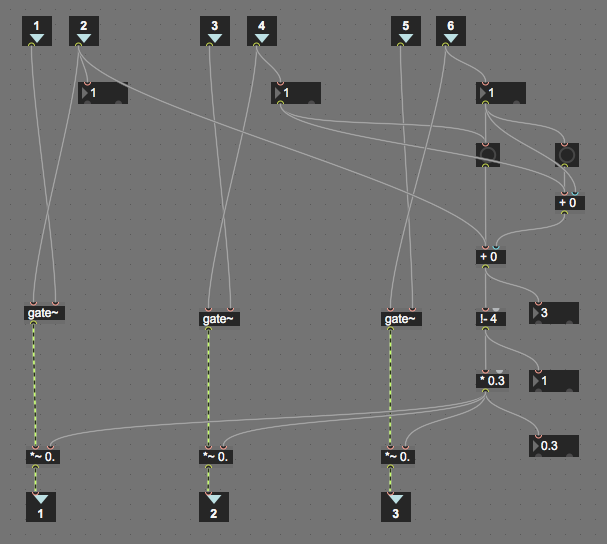 The filters are there just to provide different blocks of frequencies to the output section where the panning happens. And the three [X] toggle switches allow you to turn the outputs on and off, so if you want to have just the high-pass filter output, then just enable that toggle switch and turn off the others. 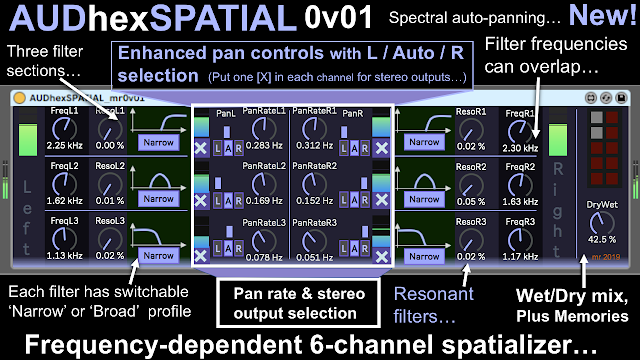 The two stereo channels are separate, so if you want different filters and pans for left and right, then that is completely possible. Of course, in an imperfect world, I may not always succeed in trying to be consistent, but I will try. Please let me know if I falter! OK, so your imagination is probably your main limitation here. If you want to have the left channel quickly auto-panning the top end of a piano sound, whilst the right channel slowly pans the bass around and both channels have two different resonant filters panning at different speeds, then that's fine. But there's more. Try putting AUDhexSPATIAL in front of a Ping-Pong Echo, or put it in between two Ping-Pong Echoes... 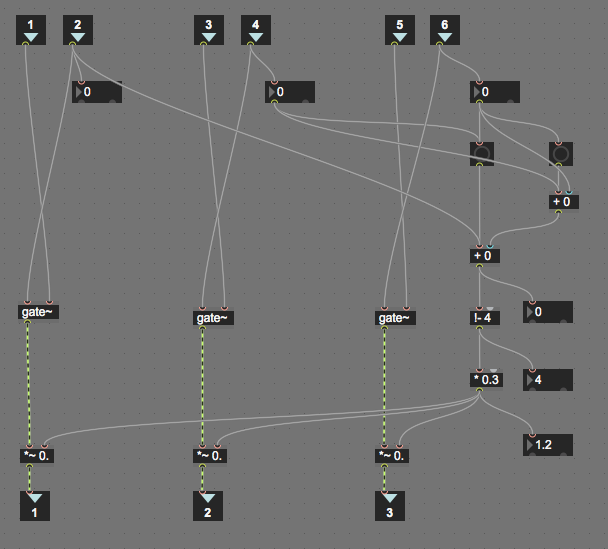 It is very interesting to experience just how complex a simple sequence can sound when it goes through this sort of processing. Recent blog posts have included details of what is happening inside my M4L devices, and this is no exception. 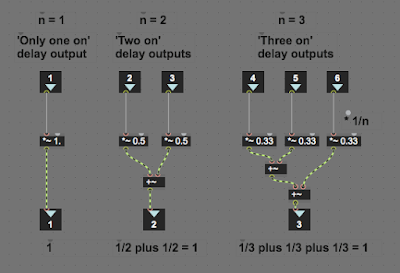 This time, I'm going to look at the three-position switch that has been added to the output section. Max and MaxForLive have a lot of ways of routing numbers, messages and signals around. There are lots of objects, with names like Gate, Switch, Route, Selector, Matrix, and more. Sometimes the objects that route signals around have different names, and work slightly differently to the objects that route numbers or messages, and they can work slightly differently. It's quite a lot to get your head around, and one of these days, I'm going to try to do a guide (a bit like the one I did on squeezing controls into limited spaces!). But in the meantime, here's the first of a little mini-series where I look at a few interesting ways to route stuff. The three-position switch does two things simultaneously: it allows you to select between hard left and hard right pan positions, or it selects the auto-pan. 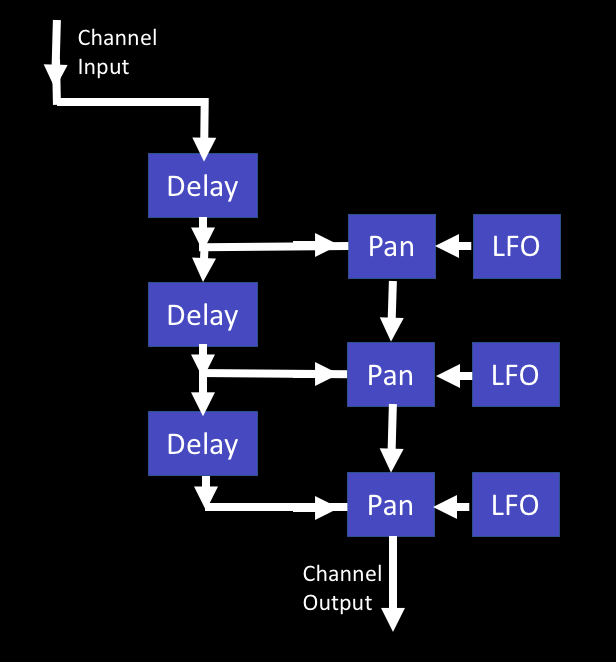 These are very different things, although if you look at AUDhexECHO or AUDhexFrequencyShifter then you will see that by slowing the LFO to 'stopped' then the result is fixed pan positions. But that isn't a very practical approach for a three position switch. There is also the complication that the output of the LFO that does the auto-panning is a signal (so it has the yellow-striped connections in Max), whilst the more usual way to control a panner is with numbers, so there's going to be a conversion somewhere. 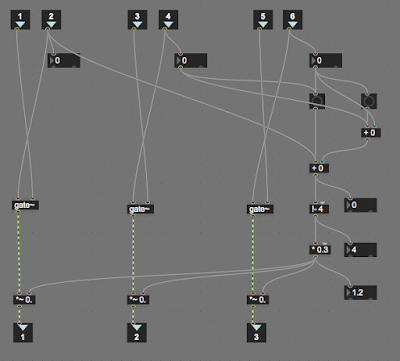 The main audio processing is on the left hand side. Input port 1 (the square box with '1' in it) is the audio signal that is going to be 'panned'. 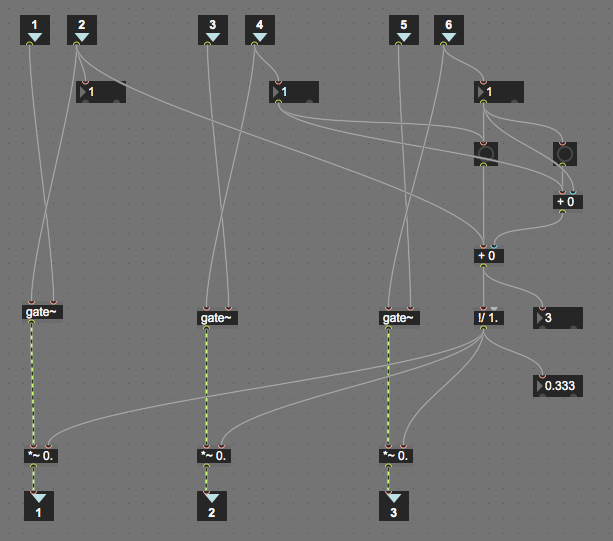 It goes to two signal multipliers (notice the '~' after the '*') that are driven in anti-phase using the '!- 1.' inverter shorthand that I've mentioned before. (The formula inside the object just subtracts whatever you feed into the object from 1, so it really means '1-the_number', and so it inverts the value, so if you put 0 in then you get 1 out, and if you put 1 in, then you get 0 out, and linearly for all other values...). The pan value goes from 0 to 1 to pan from left to right, and so centre is a value of 0.5. On the far right hand side, you can see how the left and right values re stored in message boxes that are triggered every time that the switch is changed. The 'LED" object with the round circle is a useful way to convert changes into 'bangs' that also shows you what is happening when you are debugging. The '0' and '1' messages that the message boxes output when they receive a bang are converted into signals using the 'sig~' objects. And that's how you can make a three-position switch that has fixed values on two of the settings, and an LFO signal on the other. You can download AUDhexSPATIAL for free from MaxForLive.com. In terms of basic modular equivalents, then AUDhexSPATIAL requires six filters, six LFOs, six VCAs, and a mixer, plus some switching for the fixed pan positions, giving a total of about 20 ME. It happened when I was adding some functionality to an existing plug-in, the RUSS Harmonic Rejector, to cope with some unusual audio signals that I was processing. I copied across the Nyqvist text files to the appropriate 'Plug-Ins' folder on my MacBook Pro, edited the Nyqvist plug-in code, saved it, and went into Audacity to load it via the 'Effect>Add/Load Plug-Ins' menu option - and this is where things got interesting. Now that I read that warning again, it seems to be quite important! But what is the warning actually saying? It says to use a plain text editor rather than a word processor, and I was using TextWrangler as my editor, and that is a plain text editor, isn't it? Now, the Finder is designed for 'finding' files, and it isn't particularly good at telling you much about the files themselves. There's 'Get Info...' for that, and it told me that I had two 'documents' and a document that was last saved as a 'SimpleText' document, which used to be the built-in editor for MacOS from System 7 to System 9 (I think). Unfortunately, a description like 'SimpleText' document doesn't directly indicate if it is a plain ASCII text file. ASCII, by the way, is one of the early ways of mapping numbers to keyboard characters, numbers and other functions, and so a value of 65 represents the character 'A', 49 is '1', and 10 is 'Line Feed (LF)', which is one of several characters that can indicate a new line (Carriage Return (CR) is another), and 7 is the 'Bell' character, which makes a noise (and was originally an actual physical bell!). 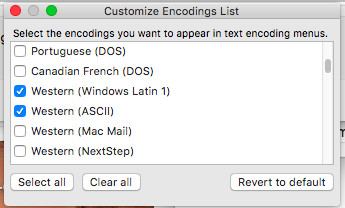 Now this says it is a text file, but there's an interesting 'Mac OS Roman' encoding, and it has Windows 'end of line' Carriage Return, Line Feed characters, so my tendency to use whatever text editor is around at the time is now biting me back! This is a text file, with ASCII encoding of the symbols on the keys, and with a Unix-style 'Line Feed' to indicate the end of each line. 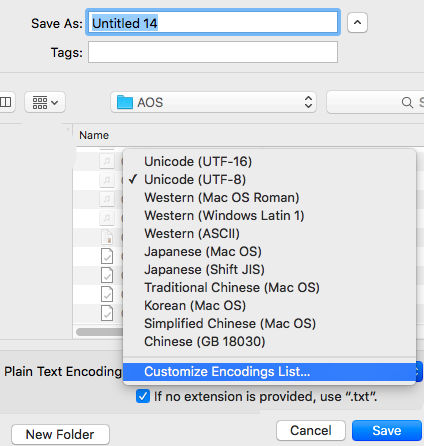 So I tried to save the Nyqvist files as Plain ASCII text files using these settings and up popped a warning that some Unicode characters could not be saved. It turns out that these were the 'smart' doubles quotes around the "title". So I took these out and replaced them with the normal less curvy double quotes and re-saved. All was well again! The plug-ins now had the correct names and were in the correct alphabetically sorted position in the menu. I also tried saving the file using the Windows 'End of Line' convention (CRLF = a Carriage Return character, followed by a Line Feed character), and that worked fine as well. 1. You need to make very sure that your Nyquist files are 'plain ASCII text'! 2. 'Plain ASCII text' requires that your editor be set to save using the 'Western (ASCII)' encoding, and ideally to not add a hidden '.txt' extension to the end. If this was a forum, then there would be a 'SOLVED' indicator somewhere around here! There are several things to note here. The first is that I should have thought more about how to edit a file, and especially how to save it - I'm fully guilty of this, and probably rely far too much on default settings to be appropriate to what I'm doing. The second is that Apple's 'it just works' approach sometimes works against you - in this case, setting up TextWrangler so that it saved plain ASCII text was reasonably simple, but only when you knew what was required (and even then, it is easy to end up with a hidden '.txt' extension suffix on the end of what appears to be a '.ny' file. The third is that the Audacity documentation indicated that there might be something that you should be aware of abut editing Nyqvist files, but it didn't give any explicit details, and so required more investigation. The fourth is that just adding '.ny' to the end of a filename does not make that 'extension' disappear, even if the macOS 'Hide Extensions' default is active - but that Audacity will still accept the '.ny' as an extension even if the Mac's Finder doesn't. What follows are some of the mitigations that can be used to try and ensure that files are created, edited and saved as plain ASCII text files, in a world where such files seem to be increasingly uncommon. 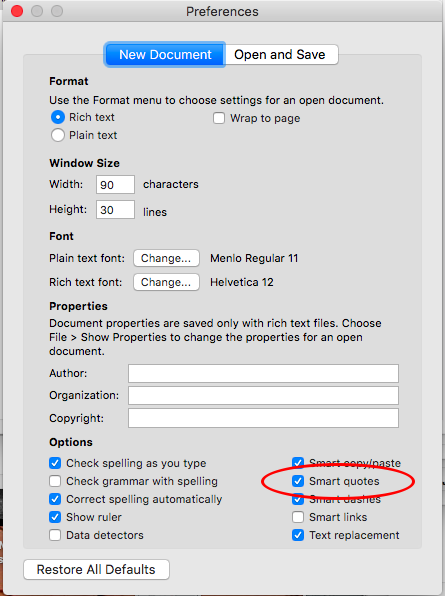 It also seems to be good to start typing in Plain text mode to avoid any smart quotes! As you can see, it isn't entirely straightforward to adjust textEdit so that it saves files as plain ASCII text! In my searching I found Sublime Text, BBEdit, Atom, Vim, Brackets (from Adobe), UltraEdit, Coda and Microsoft's Visual Studio Code. Most of these are serious, professional editors, and some of them have free versions (or trials), but none of them seemed to be at the simpler end of the range. However, I did find Coteditor (from Coteditor.com) that seems to be quite simple and straightforward, and it puts the save format right at the top of the main window, where even I would probably eventually notice it! It turns out that the 'Get Info' utility can be very useful! The 'Hide Extension' option is the default in macOS, and so even though the nyquist files have '.ny' at the end, the '1-...' test file also has a '.txt' at the end, which means that Audacity does not include it in the 'Add/remove Plug-Ins' dialogue box. The 'Name & Extension' field can be used to remove the '.txt' suffix - just click in the field and remove the '.txt', then press 'Return'. 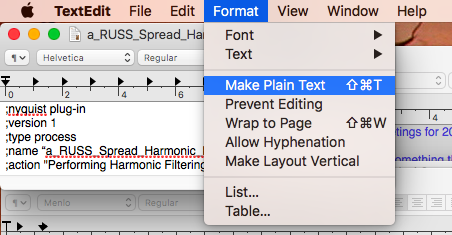 The '1-RUSS_Harmonic_Extractor_hi2.ny' file the you see in the Finder in macOS is actually called: '1-RUSS_Harmonic_Extractor_hi2.ny.txt' (yes, with two 'extension' suffixes), because macOS hides extensions by default. The '.ny' that looks like an extension is misleading, because the '.txt' suffix that follows is the actual extension. If you use the 'Get Info' utility to remove the '.txt' at the end of the filename, then you get a file which looks like it has a real extension of '.ny'. The 'a-RUSS_Harm_Extract_hi2.ny' file does not have '.txt' at the end, but it appears in the Finder as 'a-RUSS_Harm_Extract_hi2.ny', which means that the '.ny' isn't a real extension, because if it was, then macOS would not show it, and the file would appear as 'a-RUSS_Harm_Extract_hi2'... However, Audacity treats the 'a-RUSS_Harm_Extract_hi2.ny' file as if it had an extension of '.ny', and thus displays it in the 'Add/Remove Plug-Ins' dialogue box. Making sure that Nyqvist files are plain ASCII text files is very easy to get wrong, and if you do get it wrong, then your plug-in may not appear in the 'Add/Remove Plug-Ins' dialogue box, or Audacity may not display the name of the plug-in correctly. 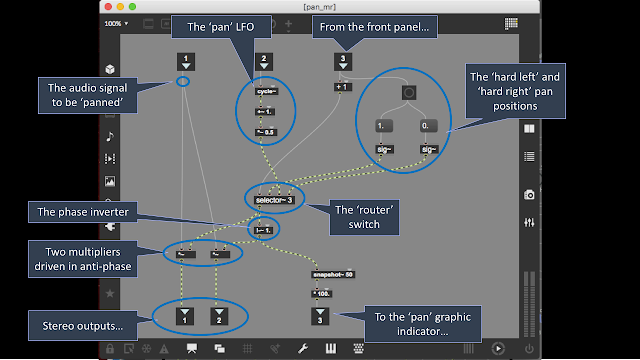 Having spent a lot of time in the integrated development environment that Max offers (for MaxForLive plug-ins, as well as Max code), then it is very interesting to see how a non-integrated development system requires more thought and organisation. I hope that this blog post will help anyone else who experiences problems with Nyqvist files in Audacity on macOS, assuming that they can find this blog post, of course! It was after I finished the hex frequency shifter that I looked at the central hex auto-pan section and thought: 'That would be interesting in an echo effect...' A month later, and here is the result, but, as usual, I'm not one for just doing a 'me too', and so this isn't your ordinary echo effect. 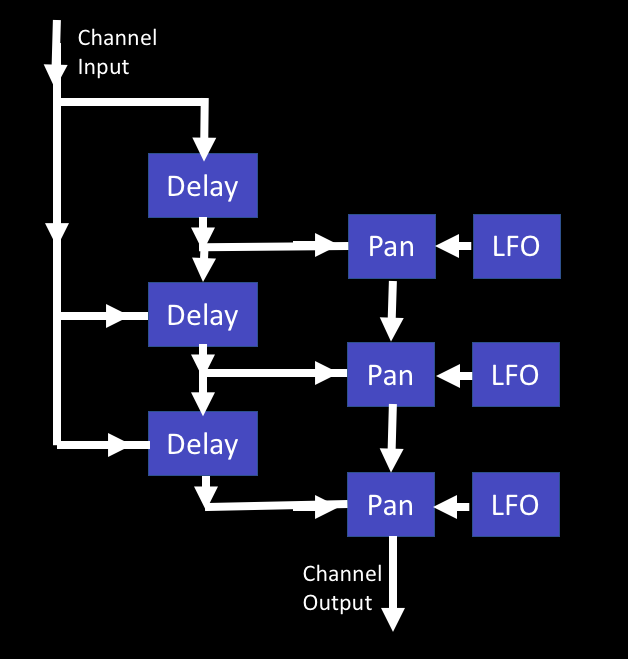 The core of the Hex Echo effect is two sets of three delays, arranged in series, but with access to the delay inputs and outputs in parallel. The output section is exactly the same as the hex frequency shifter, and allows each delay to be selected and panned separately, either fixed (with a rate of zero Hertz for the LFO) or automatically. For the inputs, then you can send the stereo inputs directly to the two delay lines, so this kind of treats them as if they were in parallel as well. The inbuilt links between the three delays are still present though, because that made the routing just a tad too complex. Apart from having to keep track of lots of signal routing, one of the trickiest aspects of the Max programming for the Hex Echo was the output pan selection. For each channel, you can select any of the delay outputs, which means that you can have 8 combinations of the three selector switches. One of the combinations isn't very useful for most of the time - the 'all off' one where no delay line gets to the output. 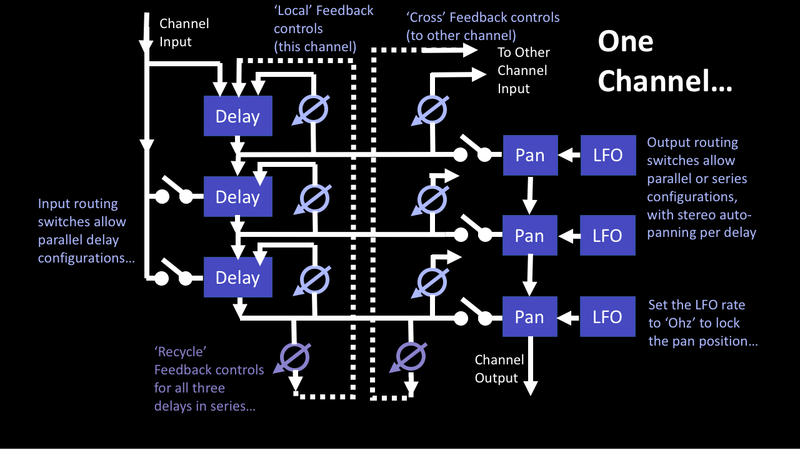 But actually, it can be useful, because you might want to have just one channel's delays in your output, and for that then you would want to turn all of the selectors in one channel off, and leave the other channel's selectors on. 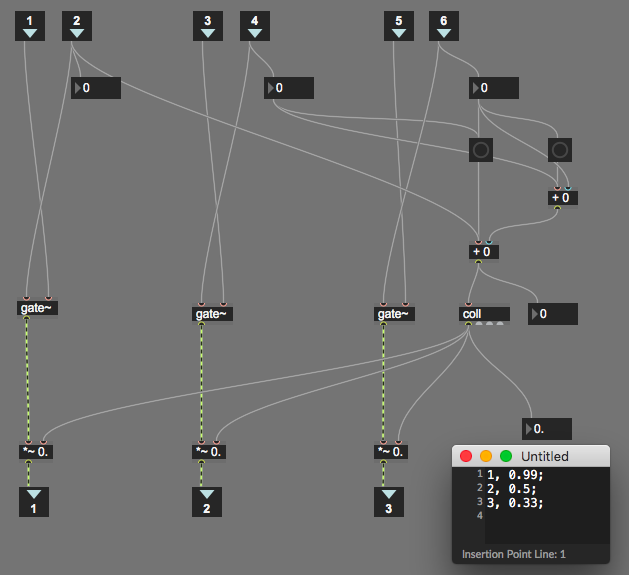 The output panning means that the outputs are positioned in stereo, so this doesn't mean that the output will be mono. 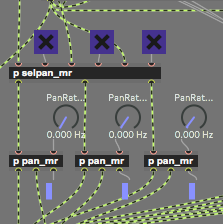 So there are three [X] selectors, which route the delay outputs to the banners (pan_mr), and the volume compensation happens in the 'selpan_mr' object, which does all the hard work. Let's work towards a general case for volume compensation by starting with the simplest case. With two [X] selectors, then there are only three possible combinations: both on, both off, and one off whilst the other is on. In the 'both off' case, then we don't care about the volume! But the 'both on' and 'only one on' cases will give different volumes: the 'both on' will be the result of two signals being mixed together, whereas the 'only one on' is just one signal. 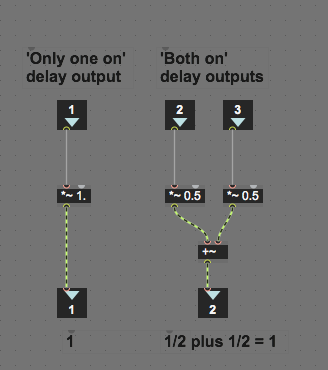 So if we use the 'only one on' case as the reference, then the 'both on' case needs to be reduced by half, so that the result of mixing the two signals together is the same as the single input. In other words: 1/2 plus 1/2 = 1. And when there are three signals being mixed together, each one needs to be reduced to one third - which is the clue to the general case. For two signals then the volumes need to be reduced by one half (1/2), for three signals the volumes need to be reduced by one third (1/3)... So, for 'n' signals, the volumes will need to be reduced by 1/n. There are three repeated sections, where an audio input (port in 1 for instance) is routed through a 'gate~' and then a '*~' multiplier (acting as a VCA) to the audio output (port out 1 for instance). Port in 2 controls that gate, turning it on and off, and so routing it to the panner object. But that control is also used to do the volume compensation. All of the Port Ins that controls the gates (port ins 2 4 and 6) are summed together at the '+ 0' object on the right hand side, just above the '!- 4' object. That '+ 0' object adds the three gates together, so if one gate is on, then the result of the addition is 1, whilst if all three are on, then the result is 3. (You can guess what the output is when two gates are on!) Unfortunately, the gate signals are the wrong way round in terms of adjusting the volume, and the '1- 4' object reverses the result by subtracting the sum from 4, so when all three gates are on, the output is 3, and when two gates are on, the output is 2, and all three gates on gives 1. The '* 0.3' does the volume magic - for three gates, then the 1 is multiplied by 0.3 and this is sent to the multipliers, so each port output will get about a third of the volume, and since all three ports are active, the resulting volume in the channel will be 0.9. If only one gate is on, then the subtraction gives 3, and 0.9 is sent to the multiplier for that gate, which gives 0.9 again. 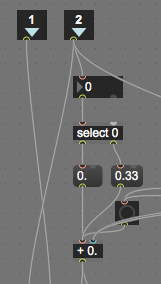 For two gates, then the output is 0.6 twice, which gives 1.2 volume, so this isn't right. 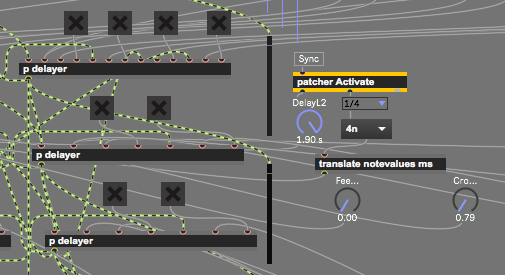 Testing Max patches with complicated sets of inputs and outputs requires a bit of planning. 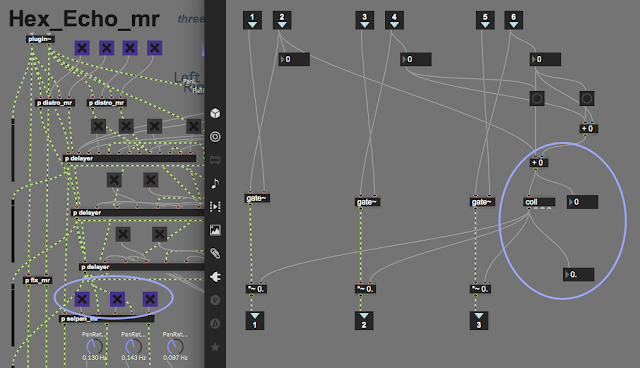 In order to use the three [X] selectors and see what is happening inside the 'selpan_mr' object that they feed into, you need to open two windows: one so that the [X] selectors can be set, and another so that the effects on the internal values inside the 'selpan_mr' object can be observed. Which gives the 0.9 multiplier for that single output. Which gives three lots of 0.3, for a final output of 0.9. Good for showing troubleshooting and testing, but that incorrect value isn't right. Compensating for volume only works if it is right! The left hand window is used to control the [X] selectors, whilst the right hand window shows what is happening inside the 'selpan_mr' object, using the number boxes. So back to the general formula: 1/n. 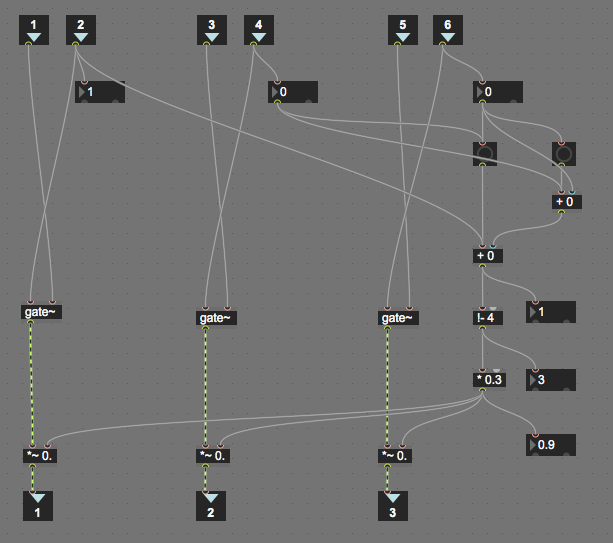 How do you code that in Max? The way to do it directly is related to the way that Max maths objects have two inputs: one on the left-hand side that is an input for a value and also a trigger for the calculation, whilst the other (on the right hand side) is just an input for a value (or is the value inside the maths object). Let's consider the case when you want a fixed value inside the object. So if you want to add 2 to 3, then you send a value of 3 into the trigger input, and an object that contains '+ 2' will produce an output of 5. But for subtraction, then this way of working has a problem. If you want to divide one number by another, then an object containing '/ 2' will produce the result '3' if you send '6' into the input, so a calculation like 6/2 is easy. But how about if we want to calculate 1/n? The value inside the object is fixed, and so we would need to use a message box to send a '1'into the left hand input, whilst sending 'n' into the right hand input, and then we would need to trigger the calculation by sending a bang into the left hand input. It is a lot of work for a simple result! So we finally have a relatively neat way of carrying out a '1/n' maths operation, although the '!/ 1.' inside that Max object still forces me to stop and think. Anyway, we now have a 'volume compensation' object that works for three inputs, and it can be extended for additional inputs relatively easily, with the main processing done by the '!/ 1.' object to carry out the '1/n' operation, and the hardest bit of extending it is finding a way to determine the number of [X] selectors that have been set - as you can see above, for just three selectors there are a lot of objects used to produce the value of 'n' that is fed into the '1/n' maths object! You may be wondering why I have the 'selpan_mr' object there at all, since it just serves as a way of lumping all of the volume compensation into one place. Well, it is my ongoing attempt to try and tidy up my Max/M4L patching! At this level, we have the three delays on the left-hand side, and the delay time, feedback and cross-feedback rotary controls for one of the delays on the right hand side. Notice that the rotary controls are connected directly to the delay object ('p delayer'). 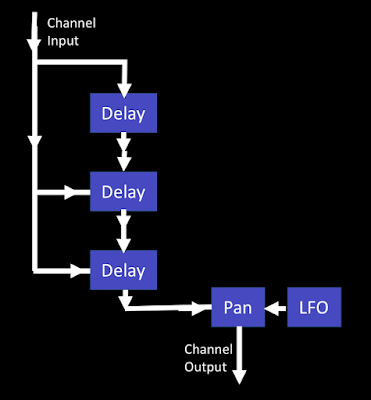 But what is inside the 'p delayer' delay object? Inside the 'p delayer' object is the standard M4L 'delay~' object from Cycling'74, but also a lot of maths objects that do all of the scaling and smoothing (using the 'line~' object) for the rotary controls. If all of these maths objects were on the higher level, then the three delays would not have been as obvious, because there would have been lots and lots of other objects everywhere. But moving the processing for the rotary controls into the 'p delayer' object, then the higher level shows the high level signal flow through the 3 delays, and this is not obscured by lots of objects just to get the rotary controls to have the right values. 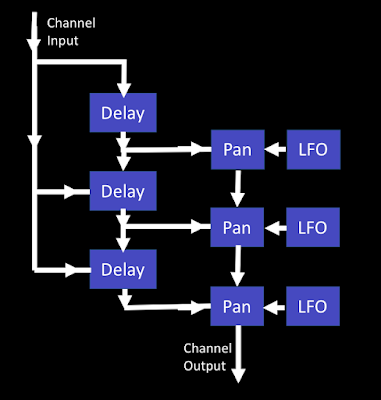 Because the two channels are separate, then you can have different arrangements of the delays and the panner in each channel. The 'cross' feedback from one channel to the other can be quite confusing if you have different arrangements, and it can be quite hard to figure out what is where. My recommendation is to use the [X] selectors to turn off signal routings and to gradually turn them back on, one by one, so that you can hear what is happening. The two pairs of vertical signal meters on either side of the panner section can also help you to figure out what is happening to the audio signals. So if you set each of the delay times to a different value, then you can get some interesting time patterns. Suppose you set the Left channel delays to 100, 200 and 300 ms, and the Right channel to 400, 500, and 600 - For an auto input in the left channel, then the echoes will be at 100, 200, 300, then 400, 500, and 600 ms intervals, whilst for an auto input in the Right channel, then the echoes will be at 400, 500, 600, then 100, 200, and 300 ms intervals. If you have the pan controls set to hard left and hard right, then this is quite a lot of ping-ponging across the channels! 1. Move the LFO 'Rate' rotary control about half way (the pointer will be vertical). 2. The Pan indicator 'block' will start to move back and forth horizontally. 3. Move the LFO 'rate' rotary control back to fully counter-clockwise when the indicator block is where you want it. Once you have the pan positions set as you want them, do a save to one of the memory squares on the right hand side of the device. (Click on a square whilst holding the 'Shift' key down...) That way you always have the positions ready and waiting! Hex Echo can be used for ordinary echoes, but the parallel/series modes and the 'per delay' feedback controls make it very good at the sort of 'cluster' echoes that you get as 'early reflections' in reverbs, especially if you have different delay settings for the two channels. 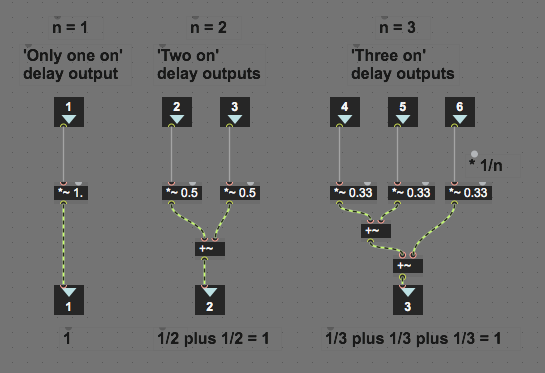 Another thing to try is to set two of the delay times short, and one long (up to 2 seconds), which can be quite unusual because most ordinary echoes don't have three delays in series... 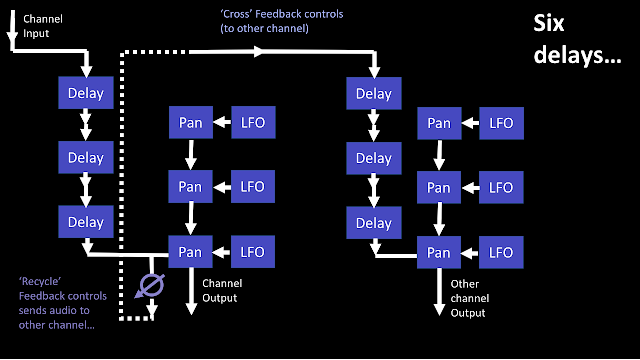 The 'Recycle' feedback goes from the output of the three delays all the way back to the input, which is a total of six seconds of delay to work with (or 12 if you 'cross' it over to the other channel. You can download Hex Echo for free from MaxForLive.com. 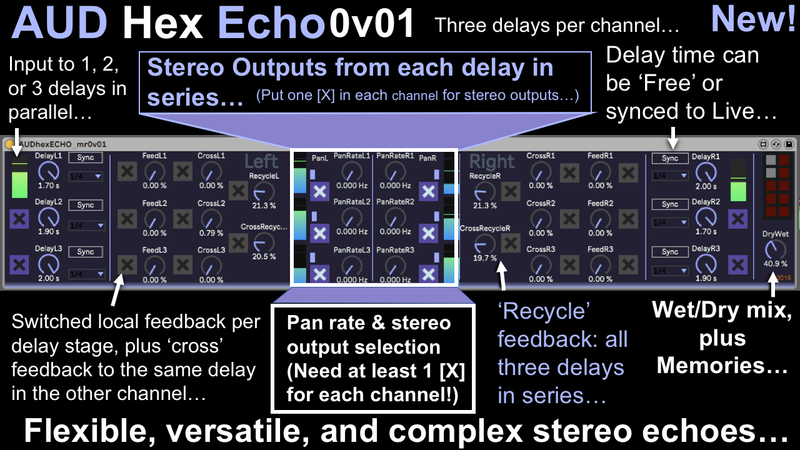 In terms of modular equivalents, then the Hex Echo obviously requires three delay stages, plus some switching, and a utility/attenuator for the recycle feedback, giving a total of about 5 ME. One of the things that I have noticed with the current generation of Eurorack modulars is that many people do quite a lot of post-processing on the audio, and I have seen quite a lot of multi-delay echoes being used. So an interesting side-effect of Hex Echo is that it can make Ableton Live sound more like a modular, which might be useful to some people. I count myself as one of those, because I have always tended to fall into the 'Trent Reznor' grouping where if people can tell how your sound was made, then you aren't trying hard enough.